After the euphoric exhilaration of new motherhood, the nagging question in the mind of a new mom is… to resume work or not? In today’s world, to be able to ponder over this dilemma itself is a luxury. For many of us, returning to work is a necessity, not a choice. But for those of us who do go back to working, whether as a full-time career mom, a part-time mom, or a work-from-home mom, we’re all looking for that elusive balance that lets us feel fulfilled in our roles, without leaving us frazzled and spent. Here are some thoughts to consider as you straddle both worlds. Is the job of a full-time, stay-at-home mom without pay a viable option for you? After considering the alternatives, if working outside home is the only logical path at this time, then weigh the benefits and costs in detail. Is that what you want? Have you checked with your employer about flexibility of work schedules, or perhaps even going part-time? Having your own money, taking your dream vacation, advancing in your career, versus, paying for a crèche, extra responsibility, less time with your baby are just a few of the things you need to consider. If the pros outweigh the cons, you are better equipped to face the challenges that come with this decision. Although dads are actively parenting these days, mothers see themselves as the primary caregivers. Be it because of societal pressures or biological instinct, it is a worldwide phenomenon that moms feel the most affected by this initial separation from their new baby. If parents or other trusted family members are able and available to look after the baby, it can prove to be the ideal solution. But, in contemporary society family support is not easily available. This is where certified childcare centres come in; if there is one near your work or home, or on your commute route, vet them thoroughly. Visit the premises and ask if they have CCTV feeds or other forms of all-day access to your child so that they are transparent about their care-giving procedures. If leaving your baby in a strange environment outside home does not appeal to you, consider legitimate au pair, babysitter or nanny services. Word of mouth recommendations go a long way in this field. Get into your new routine a few days before, rather than waiting till the first day of returning to work. Rehearse the babysitting arrangement. Drop your child off at the nursery and stay away all day, just as you would on a regular work day. It is better to deal with the emotional turmoil that comes with this step now, than on the first day at work. If you’d prefer to have a nanny, leave your baby in her care and be away for a few hours. Start the separation process slowly by stepping away during naptimes so you feel less stressed, knowing that your baby doesn’t realise your absence. Get a sense of how much time you will have to spend with your baby before and after work, and try to make it count by earnestly doing what matters most for you and your family. Lay down some foundations for the division of parental responsibilities. Who is in charge if the baby wakes up late at night? Who gets diaper duty? Who takes time off to take the baby to the paediatrician? Whatever you agree on, as long as it works for both parents, it is the right arrangement. Make your weekly ‘to-do’ lists short and relevant. Prioritise tasks: doctor appointments, bills to pay, grocery shopping, and quality time with your baby may take precedence over attending birthday parties or spending time on social media. Resist over-committing and let other non-essential things slide. If you are the main meal-maker at home, then plan a weekly menu. Find ways to make your everyday tasks efficient and streamlined. After tucking in your baby for the night, spend a few minutes preparing for the next day—whether it is packing leftovers in your lunchbox or laying out your work outfit, or gathering the baby’s things for the next day. So you are not making baby food but getting a jar of baby food this week; so you are with your baby only 15 hours a day, instead of 24×7; do you feel that it might reflect badly on your maternal standing? Consider who you are trying to please. If it is not yourself, and you are worried about what others will think, it is the wrong approach. When your baby is a beaming teenager, will they mind that you did not make mushy foods from scratch when they were infants? Or that the house was not immaculately clean? Or that you sought some assistance in keeping them safe and happy till they could go to school? Not really. What they will know and appreciate is that you were there for them when they needed you, and that you were working hard and doing all you could to give them that one degree of advantage that will make a difference in the long run. Firmly establishing your long term goals will let you gauge the everyday demands. Parenting styles have changed over the years to meet the needs of a new generation. The world we are living in is very different from the one our parents and grandparents grew up in. The consciousness now is higher, thereby making the issues more complex. Whether it is not being with your baby but at a desk job, or being exhausted from a tough day at work, or being cranky because you are sleep-deprived—guilt can nag a new mother. Fight the rising guilt! Refuse to feed it. You are committed to giving your attention, care, and love, freely and happily to your baby and your family. And that is what matters in the end. Do not confuse perfectionism with self-improvement. Perfectionism is about gaining approval from others, whereas self-improvement lets you introspect and audit each situation for its merits and limitations, and allows you to do what seems fit, what makes you feel better. Know that mess is okay. You don’t have to judge yourself on your housekeeping skills or your cooking prowess, and neither should anybody else. Learn to laugh at the ridiculous expectations placed on you by others or by yourself. Adopt the popular attitude that ‘My house is clean enough to be healthy, and messy enough to be happy.’ Laundry can pile up, unwashed dishes can wait. Resist the urge to be an impeccably dressed and charmingly witty super-mom who attends to her baby’s every need with a smile. Tempting as it may be, to project an image of having-it-all-together when you don’t is not only tiresome but also detrimental to your sanity. Maybe ‘me’ time for you is during your commute to/from work. Alternate the evenings with your spouse to get the baby settled in for the night; and use that extra time to pursue a hobby, take a bubble bath or treat yourself to a movie. You won’t prove anything by taking on the full duty of caring for your baby every moment of day. There is a reason why airplane safety instructions say apply the oxygen mask to yourself first before you help your child. Even setting aside 30 minutes a day to do whatever the mood calls for, gives you the oxygen to restore yourself. Make time for exercise! Remember to eat healthy and get enough rest. Mothers all over the world are living through similar struggles and many are sharing their insights via blogs and social media, as well as dedicated mothers’ groups. Seek out like-minded moms and connect with their shared experience. With the isolation that comes with present-day lifestyle, we are that much more anxious about tarnishing our kids’ lives and psyches. We tend to over-protect our kids and be extremely harsh on ourselves. One thing that makes it easier is peer support from the global village. Thanks to the technological advances of our century, we can forge a bond with strangers halfway across the world, who are willing to pipe up and say ‘I feel the same way you do!’ and are able to provide the wisdom and collective knowledge of this sorority. Some days you are a better employee and not so much an ideal mom; some days you are an energetic mum but not so much a fantastic friend; some days you go for a foot-massage and leave the meal-making to your spouse; and some days you are more than happy to just cuddle with your baby all day. Knowing that we cannot live up to being everywhere and doing everything is the first step to recognising that we are in control of defining what balance means to us. 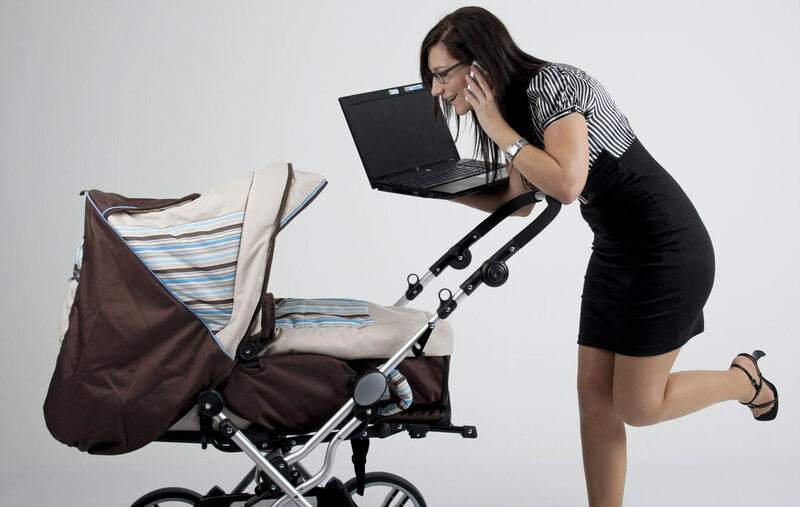 Work-baby balance is a dynamic entity. There is no such thing as perfect balance. There are work-life choices we make, which come with their own consequences. When you realise that you are not required to have super powers and do it all, you will be able to decide where you want to expend your energy most effectively and happily. Ultimately, as long as you are happy, your family is happy. When you are doing the best you can, and you are at peace with your chosen course—that’s balance. So totally agree. It has been a great read.